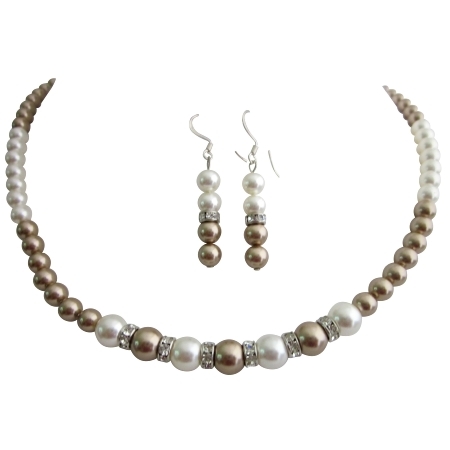 Bronze Pearls & White Pearls of Swarovski Pearls jewelry with silver rondells that sparkle like diamond spacer in beatiful Necklace Earrings Jewelry Set Very Gorgeous Sophiticated Jewelry. Handcrafted Custom Jewelry are made with Swarovski Bronze Pearls & White Pearls Collection & latest style & upcoming designs. This is very beautiful delicate sleek & elegant Necklace Set has been hand-matched & hand strung; the Necklace Earrings is The ultimate layering piece or bold & beautiful on its own you must-have this.